Have you ever wished you had the foresight to identify profitable betting angles before the race? This and many more questions can be answered by the PACE SELECTOR which uses an innovative tool that lets you develop betting strategies and handicapping methods, so that you can zero in on those on-pace runners..
As part of your subscription you will be able to use PACE SELECTOR to filter your betting approaches against our horseracing form for all Australian TAB gallop meetings. PACE SELECTOR is an essential tool for punters looking to make money from betting on Horse Racing. Our form data covers all Australian TAB gallop meetings. You can filter form by both recent & career performance, distance, price, and more. We reveal to you strategies that have won month after month, year after year, which yoiu can apply yourself. Find well handicapped horses at-a-glance using Pace Selector. You can research races, using the form factors you feel are importantr, quicker than using a form guide. Find bets quickly using our betting approaches. Imagine what you can do with PACE SELECTOR at your Fingertips? The PACE SELECTOR' handicapping tool is designed to ‘cash in’ on these on-pace runners. It’s a handicapping tool that allows you to seek out those horses who are VERY LIKELY to figure in the money and who will win an above-average share of races when shown to be well-supported in the betting market. The Pace Selector handicapping tool can be used to build winning system based on on-pace intelligence to zero in on those crunch horses. When you join we provide you with three betting Strategies which you can easily apply through the PACE SELECTOR. We were not going to list all the possible strategies here and now, why? Our clients have in most cases years, some over 50 years experience in racing, but still want a starting point. show you a winning betting strategy that we have been using while testing PACE SELECTOR. This selection strategy, when applied through the Pace Selector, generated a sensational 39.78% win strike, with 107 wins from 269 bets, whilst producing a solid 11.93% profit on turnover, for the 12 month period January 2017 to January 2018. You can see the rules in the image below, simplicity in itself, yet you wont be able to apply that yourself without the aid of the Pace Selector handicapping tool, not without hours and hours of manual work, pouring over form guides... yet the Pace Selector does it in a second. You can apply this strategy yourself, when using the Pace Selector, plus the others we provide you with when you join PLUS you can apply your own using our Pace Selector filter interface. Remember, this is only a starting point, we encourage you to pave your own way and look at avenues that you can profit from. Let us now show you why on-pacer information, when used by Pace Selector, is where the astute punter should be focused. To know how to put our money on a horse with a tip-top chance we can concentrate on each horse’s latest start. And that is the PACE SELECTOR handicapping approach. We provide you with the form filters that easily understood and highly effective. With Pace Selector, you are now in a position to easliy find that these bettable runners that are terrific propositions. You can design betting strategies, or use the methods we provide you to find horses that will provide a high strike rate for the place (1st, 2nd,. 3rd). For the purposes of the strategy above, we are concentrating on our fancied qualifiers. 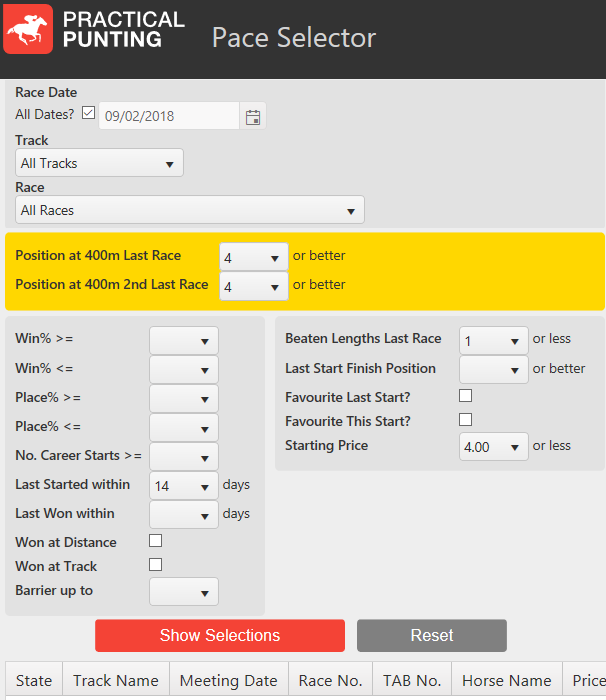 Alan Jacobs, one of our very best racing experts that researched and developed PACE SELECTOR, has authorised a limited release of his rules and results. He has had such great success with this winning handicapping tool, understandably he doesn't want to suffer from ‘over-exposure’. It has been mutually agreed, therefore, that a limited distribution of PACE SELECTOR will be made to our Practical Punting members only. But first make sure you study the features below, see how simple it is and how profitable it can be, then when you have decided that this approach may be for you – simply click the order button and get instant access to the Pace Selector along with rules and results to the three selection strategies we provide you, and get 12 month access to the Pace Selector handicapping tool - where it does all the form work for you. But let us repeat – there is a limited membership. When you join PACE SELECTOR you get 12 month access to an online interactive handicapping and selection tool, where the PACE SELECTOR form filters have been programmed, allowing you to apply the rules and generate the selections. Just set up your strategy form factors and apply them, at any TAB Australian gallops meeting and up pop any PACE SELECTOR selections. The PACE SELECTOR handicapping tool and form filter can help individual punters just like you save time and apply your chosen approach approach when and where you like. Starting today, a subscription to PACE SELECTOR is just $3.75 a week. That’s small potatoes considering the amount of time you will save and the possible winners you can identify by applying PACE SELECTOR when and where you like. But in doing so you will understand the massive ‘caveat’ ... the essential problem … that tails the brilliance of the on-pace approach. That is, its application to all TAB Australian gallops meetings is a mammoth task, when doing it manually. This is where the PACE SELECTOR provides the ultimate solution .. it does all the work for you. Exclusive access to the PACE SELECTOR handicapping and selection tool. Yes a dedicated private online area for PACE SELECTOR members, where Practical Punting’s team of analysts will show you the ‘ins and outs’ of the brilliant selection formula. we also provide you with three selection strategies which you can then apply through the PACE SELECTOR to every Australian TAB gallop meeting. Plus you can use the PACE SELECTOR to design and apply you own betting strategies.